I will start by saying This is the End contains plenty of funny moments. It’s crude, crass, and sophomoric – anyone turned off by endless riffing on masturbation and pot smoking need not apply. Seth Rogan, Jay Baruchel, James Franco, Jonah Hill, Danny McBride, and Craig Robinson (Darryl on The Office) – among many others, mostly cameos – play themselves. The simple plot involves a party at Franco’s house that occurs on the same night that the Apocalypse begins. That would be the literal Apocalypse, aka Judgment Day in the Biblical sense. It’s a funny idea, ripe with self-deprecatory possibilities. For a while it even tosses in a little subtlety. Baruchel has just returned to L.A. after a lengthy absence to party with best friend Rogan. After getting high and wrestling (establishing a latent homosexual motif that only increases throughout the film), Rogan convinces his reluctant friend to join him at Franco’s party. Baruchel hoped to avoid that whole scene. Once there he finds himself extremely uncomfortable amongst Rogen’s core group of friends, not to mention an array of other celebrities. Without giving anything away, it’s safe to say you’ll never think of Michael Cera (in what is easily the film’s most hilarious cameo) the same way ever again. Once the destruction begins, initially triggered by a 9.7 earthquake, select people are sucked up into the sky via beams of blue light. Others descend into a huge sinkhole that opens up outside Franco’s house. Franco, Rogan, Hill, Robinson, Baruchel, and McBride hole up, take inventory of their existing food, and try to wait out the disaster. As anyone can see, this is exclusively a boy’s club. When Harry Potter’s Emma Watson shows up, a surprise survivor of the earlier party, she’s dispensed of pretty quickly, never returned to again. These dudes take comfort in each other, sleep together, threaten to ejaculate on each other, and generally act as if women hold no place of importance in their world. As much as there is to laugh at, it’s too bad the whole thing wasn’t a little better crafted. 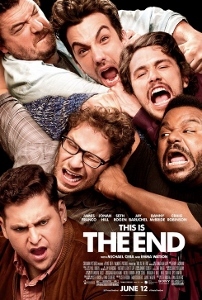 In fact, This is the End – despite largely positive notices (79% on Rotten Tomatoes as of this writing) – isn’t really any better or worse than any typical raunch-fest that gets trounced by critics and ignored at the box office. The “famous people playing themselves” conceit is a neat gimmick, but as original and audacious as it is, it isn’t developed as fully as it could’ve been. These guys aren’t really sending themselves up. There are lots of self-referential jokes, but they’re all skin deep (or based on obviously fictitious attributes). It would’ve all been far more memorable had they gone for blood, at least occasionally. As the true nature of the disaster becomes clear (that the hedonists are being left to die while the virtuous are being saved), co-writers/co-directors Rogan and Evan Goldberg have some fun with the idea that Hollywood is a good place to begin the cleansing. But tangent after tangent, including a really tired Exorcist parody (Repossessed was already dated when covering that territory 23 years ago), prevent This is the End from elevating beyond pot-addled goofiness to sharp satire. This movie looks like it would be a great one to see. Would make me laugh for sure. Can’t wait to check this movie out! .. Even if you guys have mixed feelings about it. I’m pretty sure there is not a review out there that will keep me from seeing this movie. Actually, this review makes me want to see it more (im a sucker for endless riffing on masturbation and pot smoking)! These actors are among some of my favorite, and I will be seeing this asap. I need to see this!!! good review!